One Eternal Day: "Goodness beyond ourselves"
.... What is the ethic of this film? From my seat, it is that justice must be done, and if grace exists (and it clearly does), the giving of it may be the privilege of God alone. "Is grace, like vengeance, Thine?" the film asks of God. "And have You left justice up to us?" 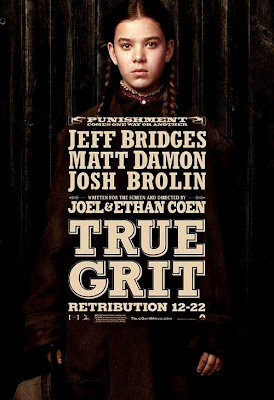 There is very little different plot-wise in this new film compared to the old one, but the Coens have managed to imbue this plot with more darkness and stronger light. They have given the tale truer grit, if you'll allow the pun, but also truer grace. This is one of those films that—like the first one—I will watch again and again. It is already available for order at Amazon, although there is not yet a release date. I was also motivated to order the book on which the movies are based. I once had the paperback but it disappeared at some point since the '60s.